Combine luxury and sparkle with this chic bangle from Buckley London. 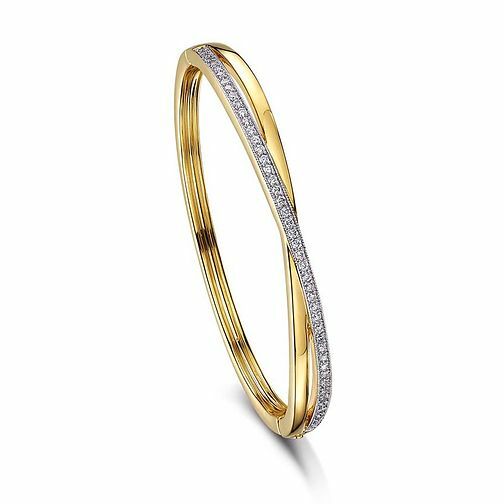 Plated in 18ct yellow gold and rhodium, this pretty bangle features a crossover style design half set with shimmering crystals and finished with intricate milgrain detailing for a touch of glamour. Buckley London Yellow Gold Plated Crystal Crossover Bangle is rated 4.5 out of 5 by 2. Rated 5 out of 5 by Anonymous from Elegance at a value price Great value looks more expensive. I also have this in the white gold and love wearing them. Rated 4 out of 5 by Anonymous from Good brownie points for me I bought this bangle for my wife for Christmas, It went down really well as it matched the eternity ring I got her for our anniversary in October. It was delivered day after I ordered it even with my untrained eye it seems good quality, She hasn’t taken it off since and the clasp and hinge still solid.